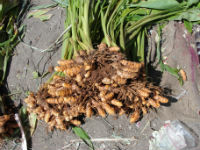 Turmeric is a rhizome (an enlarged part of a root, like fresh ginger) that is native to southeast India. Most turmeric today is exported from India. It’s available for purchase in its fresh form but is more easily found as a dried, powdered spice. Turmeric has been used as a medicinal and culinary ingredient in south and southeast Asia for thousands of years (for good reasons which we’ll get to in a bit). These cuisines and those of the Middle-East offer great tutorials on how to incorporate turmeric into your cooking. In the western world, it’s not uncommon to see turmeric listed among the ingredients of packaged foods where it serves as a dye. Mustard, canned chicken broth, margarine and salad dressings are some of the places where it crops up. And dye it does, as my fingernails and the kitchen towels attest after a cooking session with turmeric…be careful what you let it touch. Pungent. That’s putting it politely. It can be a bit strong for the uninitiated. I used to have a slight (and weird) addiction to sniffing bottles of ground turmeric just for the thrill of smelling something I found repulsive (and only when I needed it for a recipe, I didn’t go out of my way to do this). But now, after years of cooking with and eating turmeric, I actually love its smell and taste. Sourcing better quality versions (organic, when possible, sold in small quantities that won’t be lingering in my cabinet for ages) definitely helped my fondness grow. So why did I even start cooking with an ingredient I found objectionable? For a few reasons. 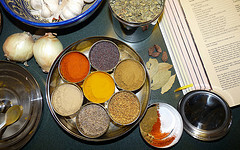 As I’ve mentioned, turmeric is prevalent in Indian cooking, and my affinity for this cuisine compelled me to welcome it into my arsenal of spices. I soon learned that pungent and strong though the spice is, it lends a great building flavor which adds complexity to a final dish rather than dominating it as you would expect from the first sniff. First-time users, I highly recommend you introduce yourself to turmeric among a cushiony melange of other spices (again, Indian cookbooks offer expert guidance) rather than going whole hog with something like turmeric tea which holds nothing back. I also found I couldn’t ignore the health claims circulating around the golden powder. Its history among numerous ancient healing traditions only commends its validity as a healthy ingredient. A valuable ingredient with long-revered culinary and medicinal use–nothing objectionable about that. The majority of turmeric’s antioxidant power comes from the phenolic compound, curcumin. To ensure maximum absorption of curcumin, include some black peppercorn (when it makes sense) in any dish containing turmeric. Time to boost your intake of turmeric. Indian, Persian and Iranian cookbooks are a great place to start. The following list of recipes and ideas will help get a daily dose of turmeric into your diet. 1. Simple vinaigrette: whisk together 1 part Raw Apple Cider Vinegar with 2 parts Extra-Virgin Olive Oil, a good squeeze of Lemon Juice and 1 tsp ground Turmeric. Season to taste. 2. Roasted Vegetables: Toss vegetables to be roasted in a hefty sprinkling of turmeric before going into the oven. I especially like to do this with oven-fried potatoes, the golden hue gives them a deep-fried look. 3. Carrot and Turmeric Soup: Roast 1 lb chopped Carrot with 1/4 lb chopped Sweet Potato, 1 chopped large Leek, 1 chopped medium Onion, and 2 cloves Garlic in 1 Tbsp unrefined Coconut Oil, a good sprinkling of ground Cumin, ground Turmeric and unrefined Salt until soft, sweet, and starting to turn crispy. In a soup pot, combine the roasted vegetable mixture with half a chopped Red Chili, 1 Tbsp grated fresh Ginger, and enough Water or Stock to reach just below the surface of the vegetables. Simmer for about 20 minutes then purée everything in a blender or with an immersion blender. Return soup to the pot and stir in sliced Green Onions, Lime Juice to taste, and enough Coconut Milk (I used about 3/4 of 1 can) to reach your preferred level of soupiness. Taste and season with cracked black pepper as well as more salt if needed. 4. Roasted Chickpeas : Great as a snack, salad topping or garnish for the Carrot and Turmeric Soup. Don’t let the sprouting stop you from making these. The recipe does well with freshly cooked or canned chickpeas, just as long as they’re dried of excess liquid. 7. Tofu Scramble: or whisk turmeric into scrambled eggs before they hit the pan. 12. Fresh Turmeric Tea: Bring 2 cups of Water and 2 tsp peeled and grated fresh Turmeric to a boil. Reduce heat to simmer for 20 minutes before straining and serving. Consider adding a cinnamon stick or a few cardamom pods during the 20 minute steeping time. A squeeze of lemon juice stirred in just before drinking is almost a must.